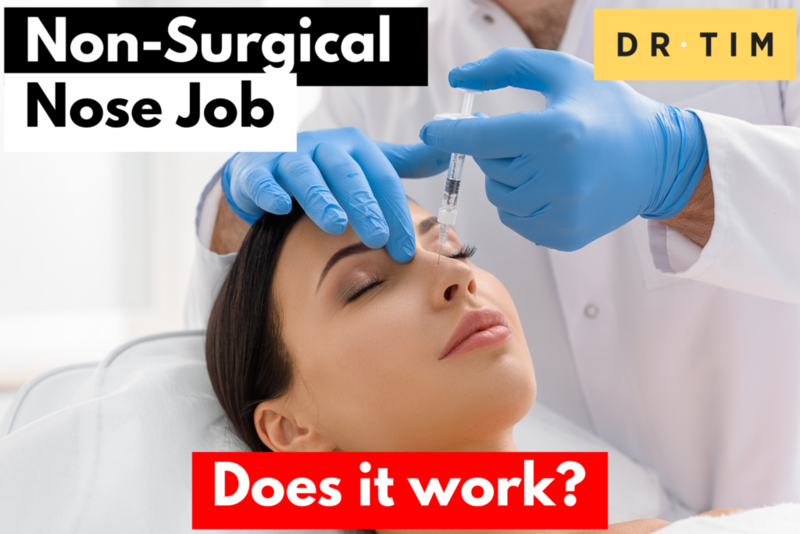 Non-Surgical Nose Job – Does It Work? A non-surgical rhinoplasty (nose job) involves injection of safe and eﬀective ﬁller materials (typically hyaluronic acids, tiny calcium granules or fat injections) to alter the shape of the nose. Non-surgical rhinoplasty can only be used to alter the shape by adding structure to the nose and cannot remove any structure from the nose. It is always an “additive” procedure because placing more volume in the nose makes it larger (remember very few primary rhinoplasties are performed to make the nose larger). The most common ﬁller material used for non-surgical rhinoplasty are hyaluronic acid fillers as they can be injected and molded into shape, yet ﬁrm enough to maintain their shape after injection. They are very safe and well tolerated by the body. It is very important that the ﬁller material is injected deeply, just above the bone or cartilage of the nose. Non-surgical rhinoplasty is a quick and easy alternative for those who want to improve certain features of their nose as indicated above. Non-surgical rhinoplasty takes less than 5-10 minutes to perform and has minimal discomfort and minimal recovery associated with it. Results typically last up to one year. The good thing about a non-surgical rhinoplasty is that it is not permanent and if you don’t like your nose enlarged, the ﬁllers will be resorbed in a several month period and it will return to its original size. Fat grating may oﬀer a more permanent solution short of surgery. Non-surgical rhinoplasty should ideally be performed by a surgeon who is also experienced in surgical rhinoplasty.